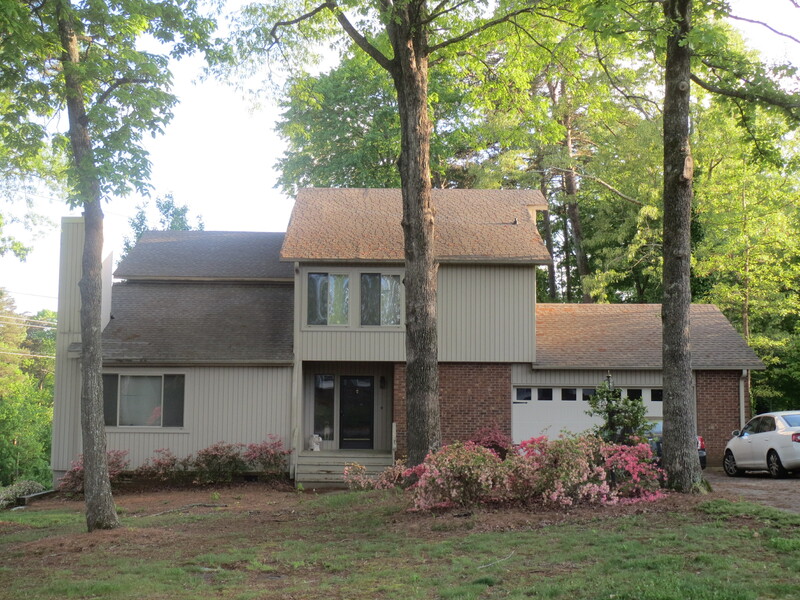 The House on the Hill Blog – Page 16 – Renovating a house from the 70s in the South. I keep telling myself I’m going to blog regularly but then I don’t. To be fair, we haven’t done a ton of stuff around the house since I’ve been missing. Yesterday, I decided to make a list of all of the small – medium size projects we keep putting off and today I have decided that for the next four weeks, we will cross as many of these off our list as we can. The list actually spans two full pages and I’m sure I forgot some things. As I looked over the list while taking a little break at work, I decided to start scheduling out projects. As luck would have it, I have 4 highlighters at my desk which means that I can break projects down into groups of 4. Months seemed a little too overwhelming since the lists were so much longer, so I decided to go with four weeks. And wouldn’t you know it, here we are just about to start a new month so I decided to declare the month of April as the month of productivity. Kyle argued that April = April Ludgate = least amount of productivity possible. For anyone who isn’t a Parks and Rec fan, you probably won’t understand that and you should also go get comfy on the sofa and binge watch all of the seasons that are on Netflix. Worth it. Anyway, clearly I won that argument. Let’s keep in mind that some of these “projects” are as little as switching out our almond colored outlets for white ones or raising our curtain rods while one project involves removing a wall and raising a ceiling. My plan is to post the project schedule for each week on Monday and keep you updated throughout the week or maybe just do a big roundup at the end of the week depending on the project. Let’s keep in mind though that while I am supremely amazing at making plans, I am also exceptionally awful at following through. That’s enough rambling for now. Here’s what’s up for Week One. Oh by the way, we’re in the middle of a big closet project and Kyle built a couple of awesome nightstands for our bedroom…which has also been painted…and dressed up a little bit. More to come, I promise! Yeah, so here we go. Maybe I should make some sort of deal with myself like if we finish all of the things we have planned we get something awesome? Maybe? Hm. Yep, we built a table. Well, Kyle built a table and I sometimes held things and loudly voiced my opinion. Want to see? I’m in love. As with all projects around here, this one took us a while to get started on. We actually bought the lumber months ago (over the summer, I think) but didn’t really start on it until November and then we finished it up a few weeks ago. Sorry, but you know, life and other excuses. 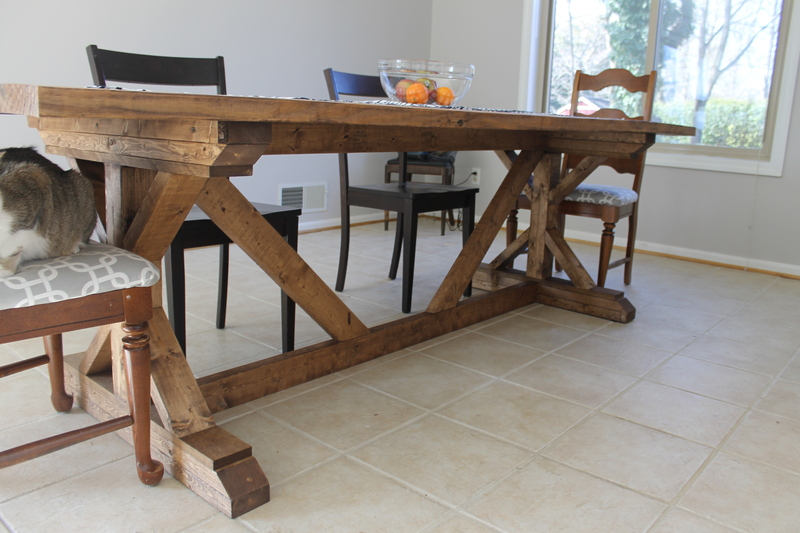 Let’s get real for a minute – our old dining room table was a joke. I bought it used off a fellow student in college for a whopping $125 for the table and chairs. After that, it sat in storage for 6 months and then we used it heavily. It was a cute table but it wasn’t really a quality piece. In fact, it’s pretty close to falling apart as we speak…of course I’m sure it didn’t help that we used it as an indoor/outdoor table when it was clearly never made to spend even a nanosecond in the elements. We maybe left it out in the rain and hot southern sun once or twice (or maybe like every single day for 3 months of soggy, humid summer). It was never a question that we would eventually be getting a new table but I wasn’t sold on our abilities to build one at first. 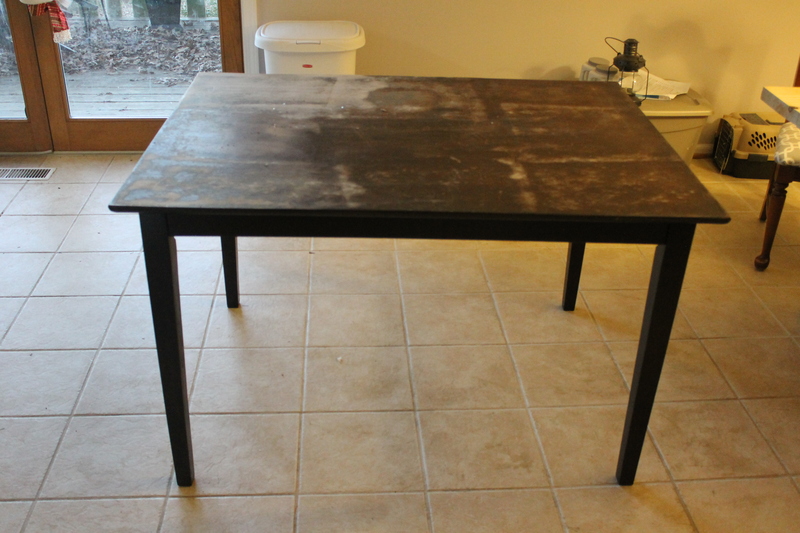 That changed when I started looking for a new table to fit what we wanted (8ft, a little rustic, built to last) and I couldn’t find anything that didn’t break my little frugal heart into a million zeroes. Naturally, I turned to the good ole Google for a little help. Can we all just give thanks for Ana White right about now? She’s pretty much my favorite person these days. Do you want to build some furniture? “Oh I don’t know, what kind of furniture?” It doesn’t matter. Seriously. Just go look on Ana’s site and you’ll probably find plans for it. I love having plans to follow. 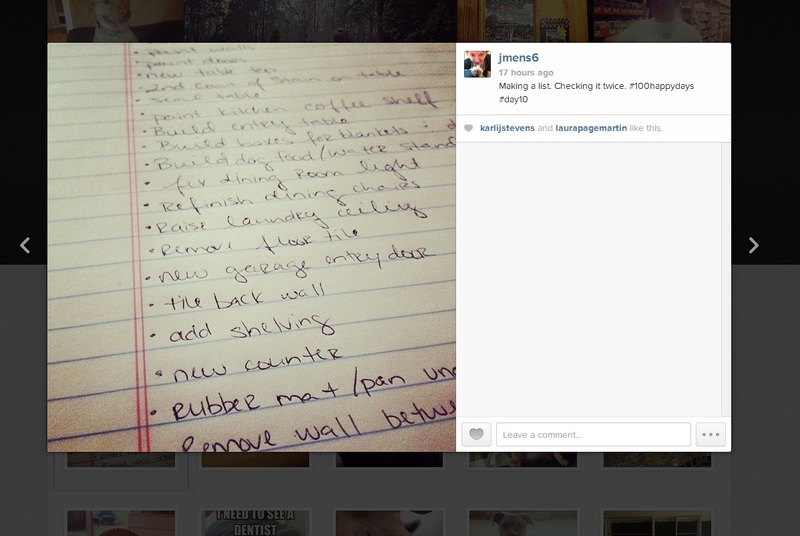 Crossing off steps of a process or an item on my to-do list is like some weird kind of therapy for me. I loves it. This wasn’t even my to-do list and it still thrilled me to no end. We chose to go with the 8ft length because that’s what we wanted anyway and the planks were sold in that exact measurement so it made it pretty easy to just keep them as is. 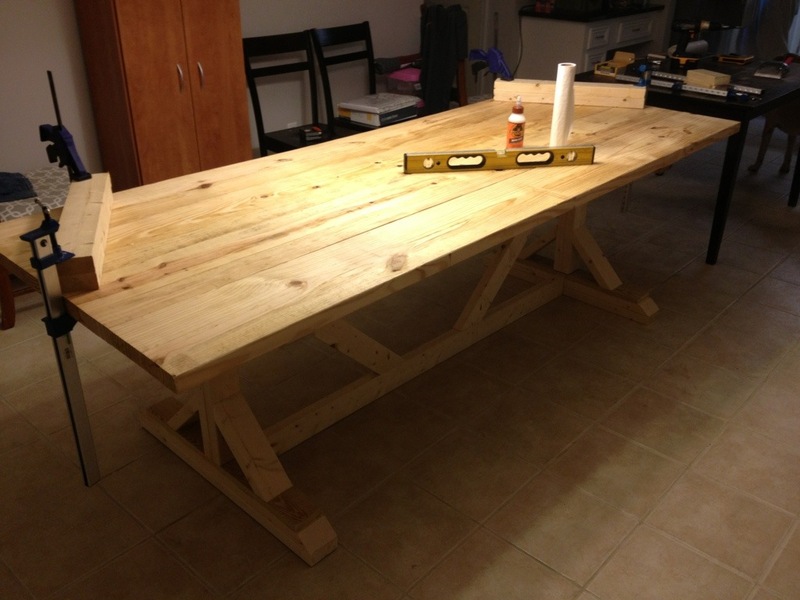 You can always mess with the measurements a bit if you want a smaller or larger table. In the end, we decided to go back with some wood filler between the cracks so that the surface was a bit more solid since some of our cracks were a little wider than we would have liked. 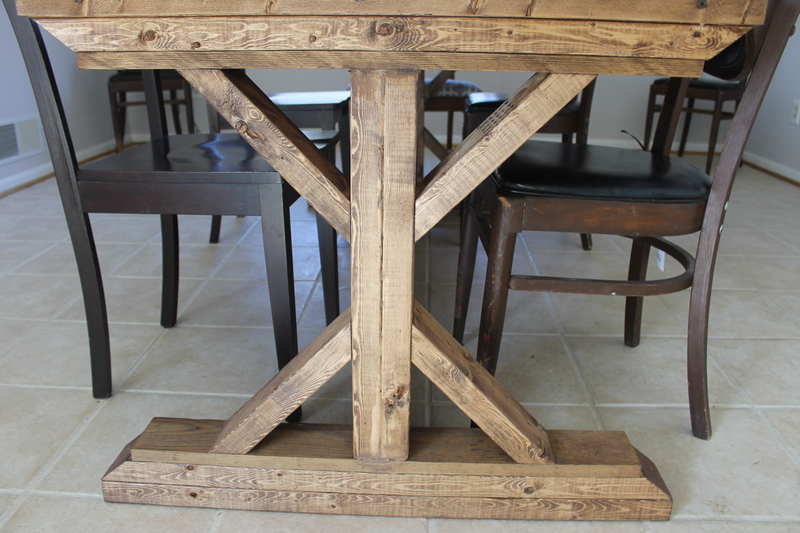 This is the one thing I absolutely would have done differently with this table – either skip the wood filler and leave the cracks or build the top differently to minimize the cracks. We knew the filler would take the stain a little differently but to be completely honest, that’s the one thing about our finished product that I’m not happy with. The last thing we did was to apply pre-stain conditioner and then stain the sucker. 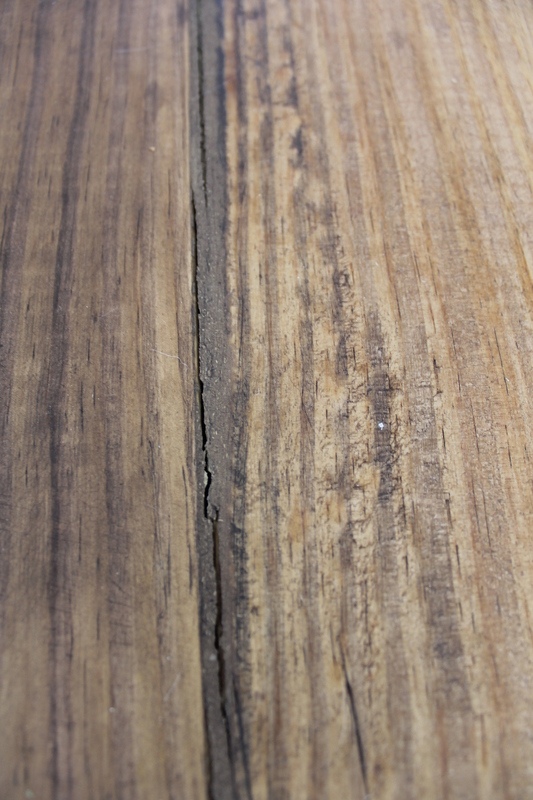 We tested a few different stains and ended up with one coat of Minwax Special Walnut. The final step will be to seal it. We haven’t done that yet because we aren’t sure if we’re happy with the finish or if we want to do another coat. We’ve been putting it off but I think this may be the week we finally either do a second coat or seal it. As you can see, the rest of the room is still a major work in progress. Now we just have to work on refinishing some chairs and figure out the rest of the room. Seeing this makes me wish I could take a hammer to all of that tile but sadly new floors aren’t in this year’s project budget so for now I’ll just have to continue to creepily whisper “patience” to myself every time I walk into the kitchen and dining room. In case any of you are interested in building your own set of shelves, I’ve put together this tutorial to walk you through it. I promise it’s easy! 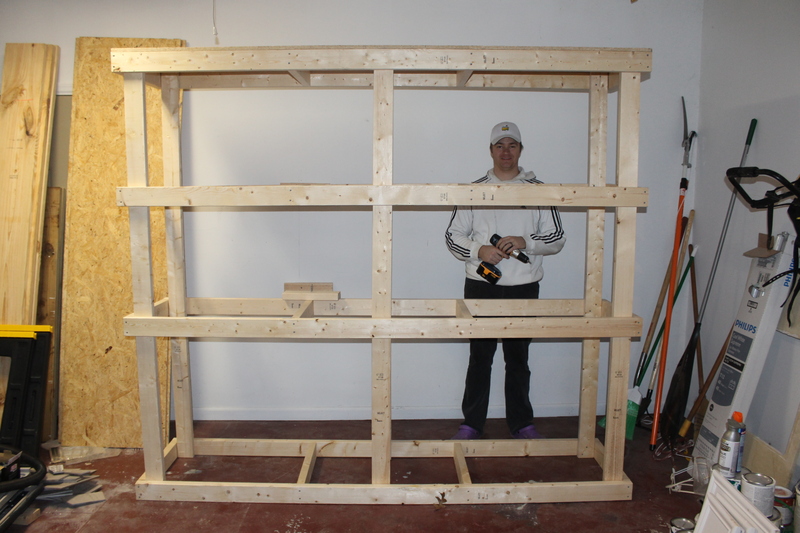 Next, we secured one of the sheets of plywood to one of the frames to make the top shelf. We could have waited on this step but figured it was easier than having to break out the ladder and do it once the unit was up. Then, we laid out all four frames and started attaching our legs. We decided it would be easiest to build the unit on the ground perpendicular to the wall it was going on so that we could just lift it into place. The legs will go into the four corners as well as the middle- we secured them to all four frames. Then, we hoisted her up and scooted her into place. It was important to us that this be very secure – nobody wants to be attacked by a large, heavy shelving unit when they get home from work. To make sure that it wouldn’t be doing any swan dives, we wanted to secure it to the studs in the wall. 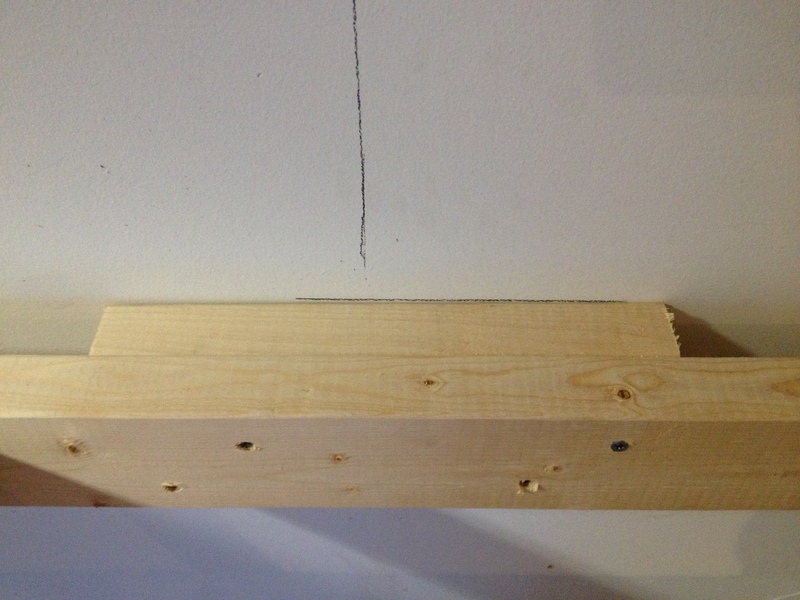 Our garage is trimmed out around the base so the best way to do this was to attached two cleats to the wall using scrap wood – making extra sure we hit the studs (we used my awesome new stud finder and then drilled some pilot holes into the wall to double check). Then, we just screwed the unit into the cleats. I stood up on the bottom frame and hung onto a leg without the unit budging at all. The worst part of the project was notching out the plywood which is the next step here. Kyle measured the distances between legs and from the outside of the frame to the back of the legs to figure out how much needed to be notched out. He marked all of these measurements on the plywood and used his jigsaw to cut in. Unfortunately, it took us about 4 attempts to get the first one to fit. After that, it wasn’t nearly as bad – we just learned to cut out a little bit more than what we marked. 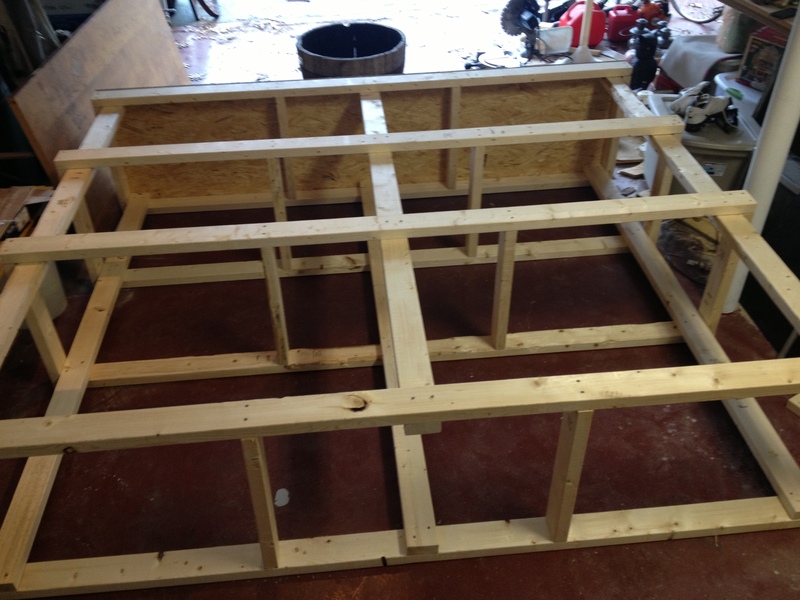 The last step is to just attach the plywood to the frames – I did two screws on each end. I left the middle along because it seemed to sit pretty flush by itself but feel free to add some more screws. Ta Da! Load up those shelves and then reward yourself with a beer or a nice glass of ice water. I cannot even believe I’m going to share these pictures with you but for the sake of showing you how badly we needed a storage solution, here goes. Just like ripping off a band-aid. That’s not even the worst part. Ready? Are you sure? The worst part is that it used to be so much worse. I KNOW. It’s awful. And it’s been this way pretty much since we moved in last Spring. Organization was not a priority for us in 2013, obviously. That’s all changing; 2014 will be the year of organization! 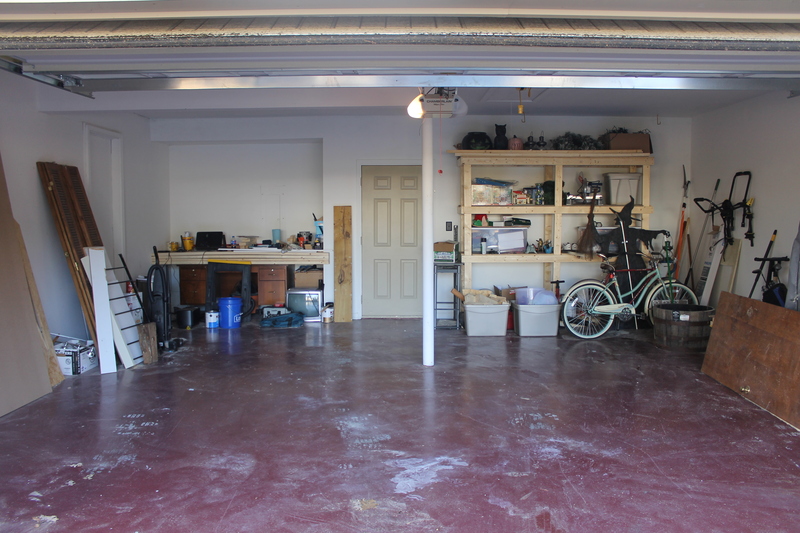 The garage is the first of the large beasts to be tamed but don’t worry, we still have plenty to take care of inside – embarrassingly messy photos included. I decided on or soon before New Year’s Eve that as of January 1, we would finally be able to park in the garage for the first time. We got halfway there before we realized that we couldn’t actually deal with the other half. Why? Oh, nothing big only we didn’t have anywhere to put anything at all. Womp, womp. So the deal was the I would start parking in the garage (Hallelujah!) and we would build a storage system over the weekend. Okay, so they aren’t very pretty but dang they’re functional. I’ll give you guys the rundown on these soon but I figured it would be better to put them in their own post. 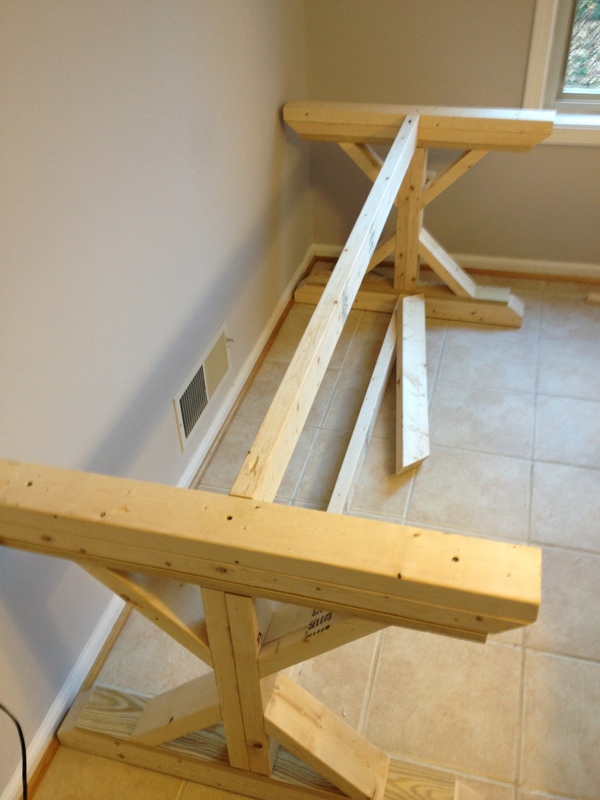 They weren’t too difficult to build – the worst part was the crappy drill bit we had and the inevitable measure 40 times, cut 97 times when we got ready to install the plywood. Not only were the shelves totally necessary but it meant I would get to try out our new baby aka my favorite tool ever: the mitre saw. As soon as we had them secured to the wall, I started loading them up while Kyle worked on the other organization project we had going on which I hope to share next week! 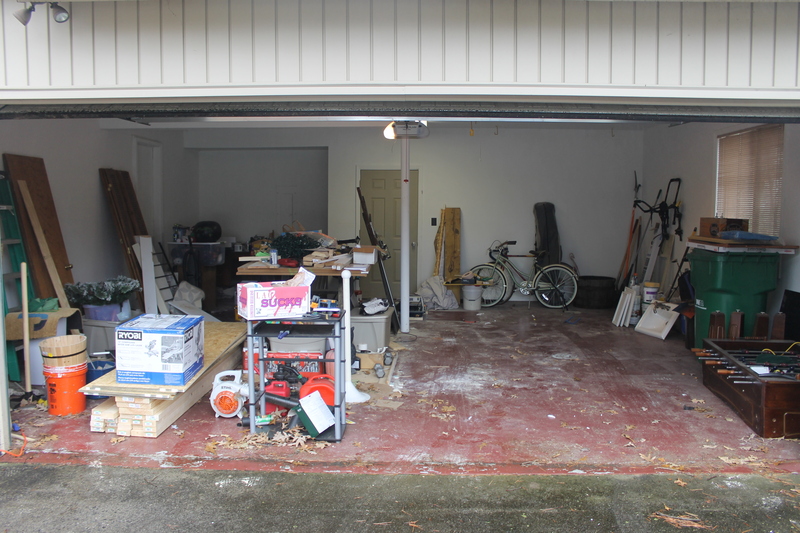 Once the shelving unit is finished and loaded up, we were able to get the garage cleaned up enough to park both of our cars in there. It’s a 2014 miracle! 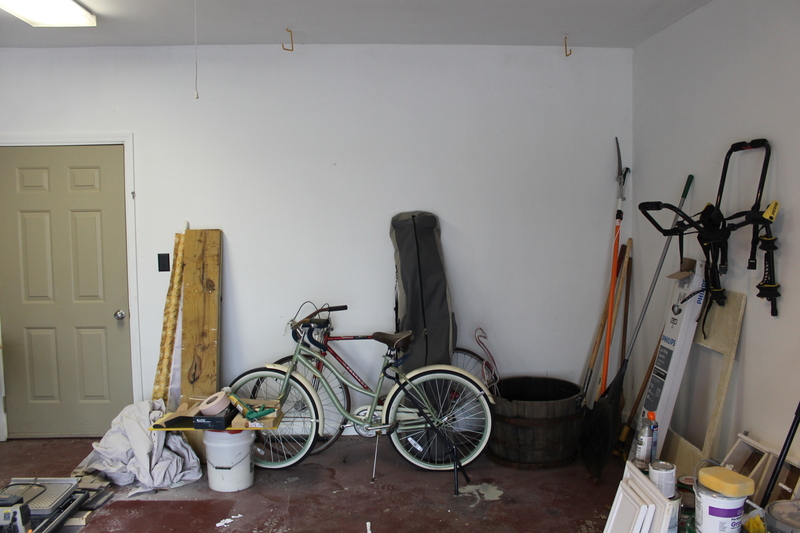 We’re not done with the garage by a long shot – there’s still plenty to clean around the edges and we have materials for our next big project lurking about but it’s one heck of an improvement over what it was. 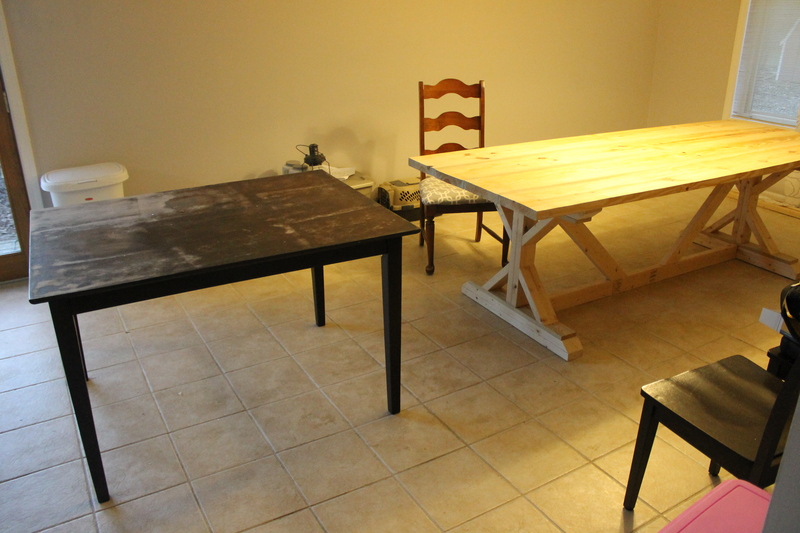 I’ll be posting a tutorial for the shelves later in the week and then I’ll finally be sharing our dining room table! We stained it over the weekend but we’re waiting a couple of days to make sure we like the finish before sealing and sharing. To say our animals are spoiled would probably be the biggest understatement of 2013…or possibly of the entirety of the history of the universe. They all get plenty of love and affection, copious amounts of treats, and a nice big bed to sleep in-no matter how uncomfortable a position we have to sleep in to accommodate them. Well, now our cats have yet another item to brag about to the squirrels they taunt outside the living room windows: their very own room. Okay, so it’s not really a room, it’s a closet, but I think that’s probably more than the squirrels have anyway. When we first looked at this house (almost a year ago! 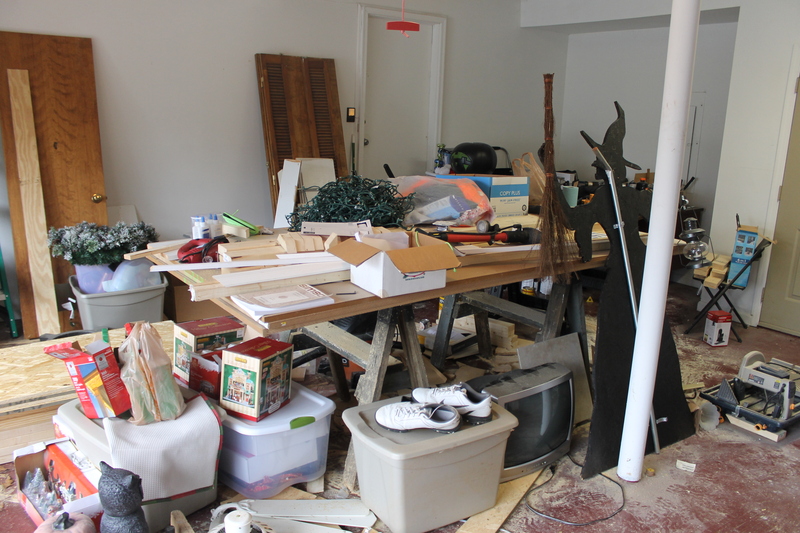 ), one of the first things I noticed was the abundance of closets downstairs. Who doesn’t love storage space, right? The nice thing about having so many closets is that we were able to sacrifice one for dedicated cat space. 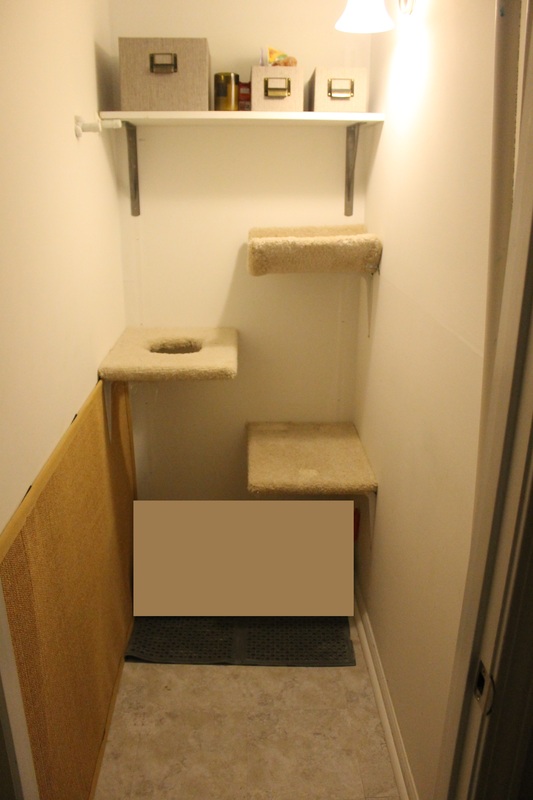 The first thing we did in here was install a cat door and push the litter box in. I cannot tell you how nice it is to not have to share my bathroom or laundry room with cats which is what we’ve done in the past. At our apartment, the litter box stayed in the guest bathroom but if we had people staying with us, it would have to be moved into our bedroom and then back again. At the rental house, our messy little hellions always covered the laundry room floor with litter which was never fun to step on. Having a dedicated space for them might possibly be one of my favorite features of our house – spoken like a true cat lady. Anyway, getting back to the real point of this post, the second thing we did was rip out the carpet. Y’all, this closet smelled rank. We’re pretty sure the water heater used to live in this closet and that it leaked at some point so one day when we couldn’t take it anymore, Kyle ripped out the carpet and tossed it in the garbage (technically he tossed it in our garage and it sat there for weeks, but I digress). We had a box of leftover tile that the previous owner’s stowed away in another closet, so Kyle put them down temporarily (no mortar, no grout, just laid them loose to have some kind of flooring) and tossed a rug on top. Fast forward 8 months, and I decided to finally do something about this sad little space. Mostly, it was because I was tired of staring at the eye sore of a cat tower living in our entry and wanted to somehow put it in the closet and I figured if I was going to do that, I may as well do what I could to make it a comfortable place for them to hang out. So, one late Sunday afternoon, I decided to tackle this project while Kyle worked on our new table (Eeeeek can’t wait to show it off! Still have some staining to do but soon, I promise). 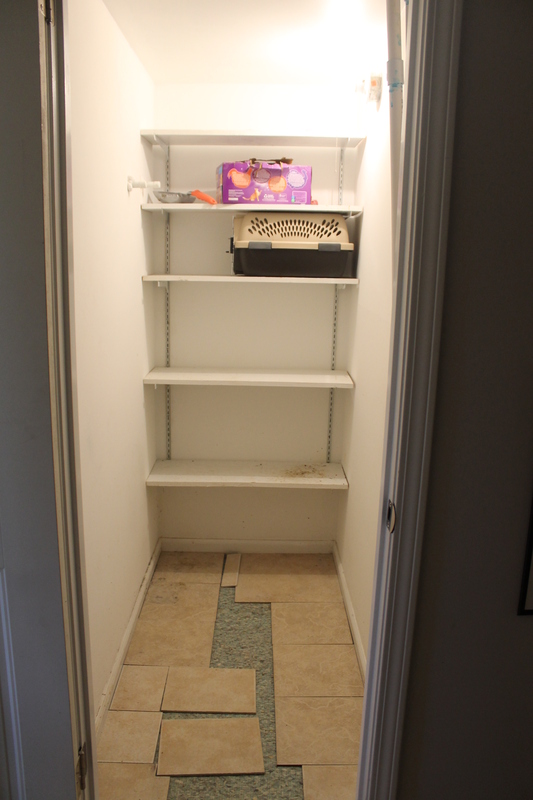 Well, color me surprised, when I took out the rug and tile and found that while the carpet had been removed, the carpet pad was still there…silly husband. I thought that once I got this out and let the closet air a bit, the smell would start to go away. Yeah, no. As soon as the carpet pad was up, I discovered a really disgusting subfloor. We looked into our options and decided the best thing to do was to prime over the subfloor, cover it with plastic, and then lay new plywood (of which we had just barely enough already sitting in our garage) on top of that for the new flooring. You guys, this closet still has an awful smell (and not a “two-cats-use-this-room-as-their-bathroom smell”). I’m thinking eventually I may go crazy enough to just rip everything out start from the studs and joists but by the time I realized the smell wasn’t going away, I was already too far in. 1) Laid peel and stick tile flooring. 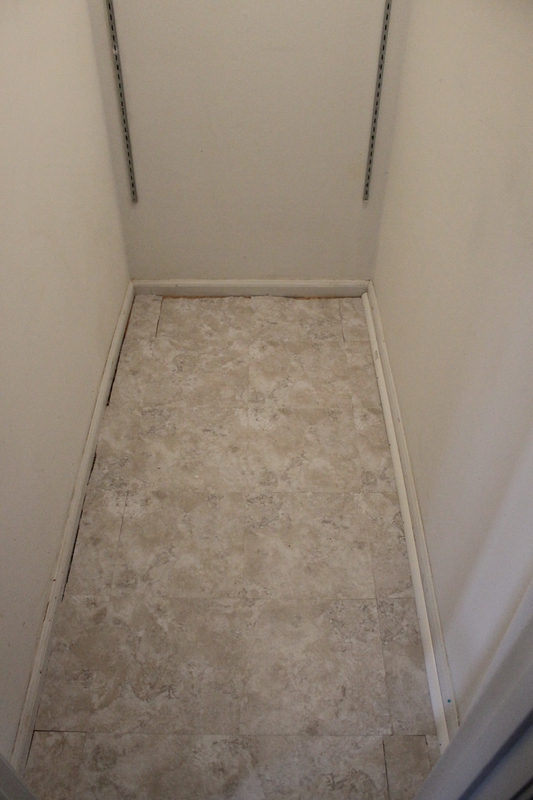 This was super easy – I just found the center of the closet and started laying the tile there. These were easy to score and break when the situation called for it. 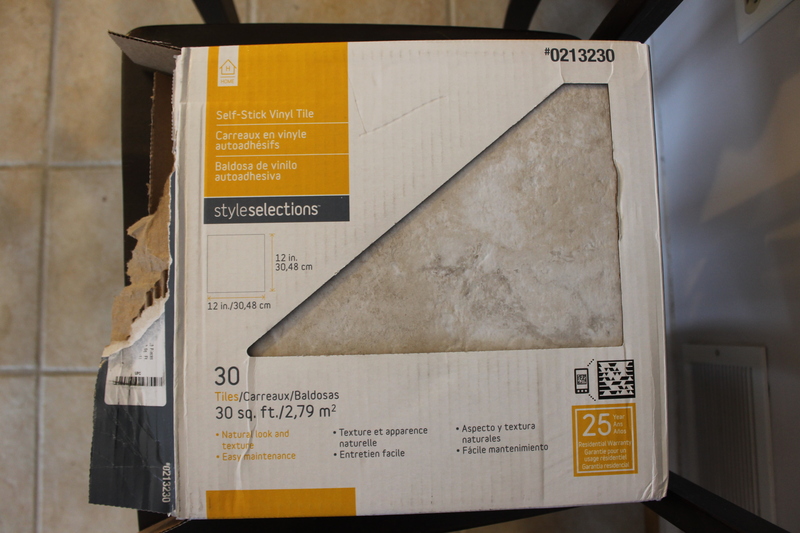 Eventually, this closet will have hardwood flooring but that won’t be for at least a year and this box of tile was $20 so we figured it was worth it to have something other than raw plywood. I wasn’t particular with the edges since I knew we would be installing quarter round and the scratching wall. 2) Scratching wall. I ordered a sisal rug off Amazon for $35 (Available here, if you’re interested). 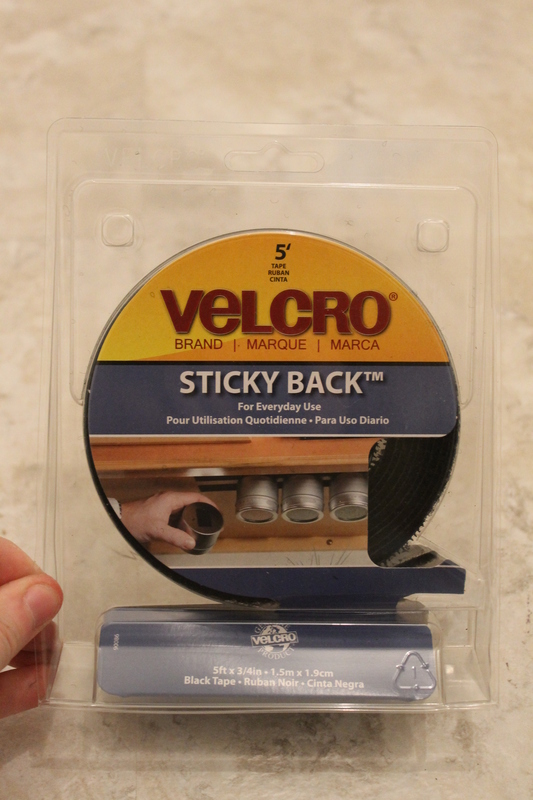 I used an entire roll of velcro that I picked up at Home Depot (or Lowe’s maybe?) to adhere it to the wall. It’s been almost a month and so far so good. We’ll probably rub some catnip into the rug for extra attractiveness. 3) Climbing shelves. The three carpeted shelves were part of the cat tower I mentioned earlier. I just disassembled the tower (which was a pain and a half – there must have been at least 100 staples) and with a lot of difficulty, we secured them to the wall using brackets. 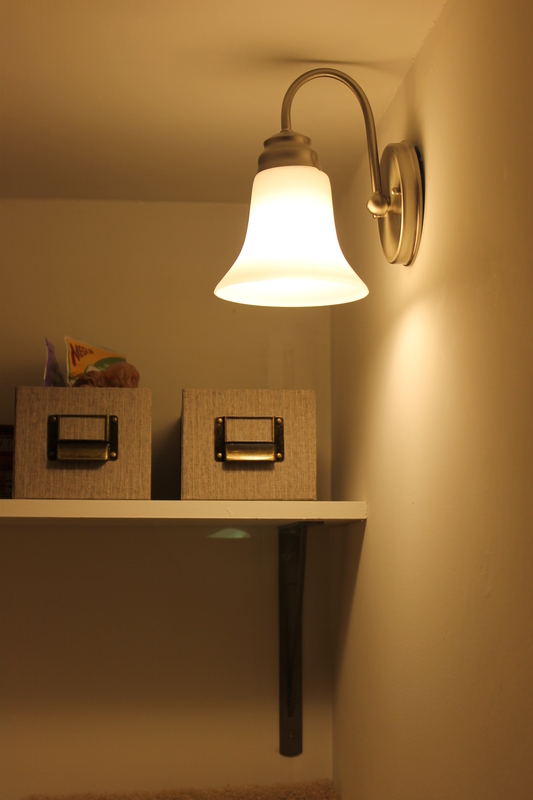 Spoiler alert: we couldn’t find any studs so dry wall anchors were our saving grace here. 4) Storage/organization. The storage bins on the top shelf are from Target and are used to house the food, treats, and miscellaneous cat supplies respectively. 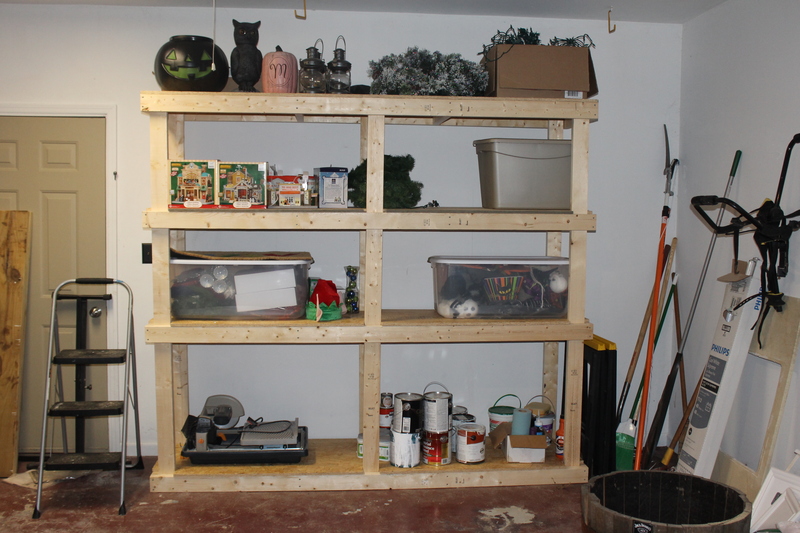 The rest of the shelves that were originally in the closet are currently living in our garage. Now all we need to do is buy a bag holder (we used to have one and it was super convenient) and either buy or build a holder for the litter scoop. 5) Lighting. I (with the help of Kyle) removed the old exposed bulb and exterior box, and installed a new light fixture. I wanted to get rid of the ugly bulb but didn’t want to spend a lot of money. This guy was less than $20 from Home Depot. There’s no switch, and it was a little more work than I thought it was worth to wire one, so we just installed a remote (just like we did with the dining room light). This was the first time I’ve ever done anything electrical and it wasn’t as hard as I thought it would be but there were some frustrations. 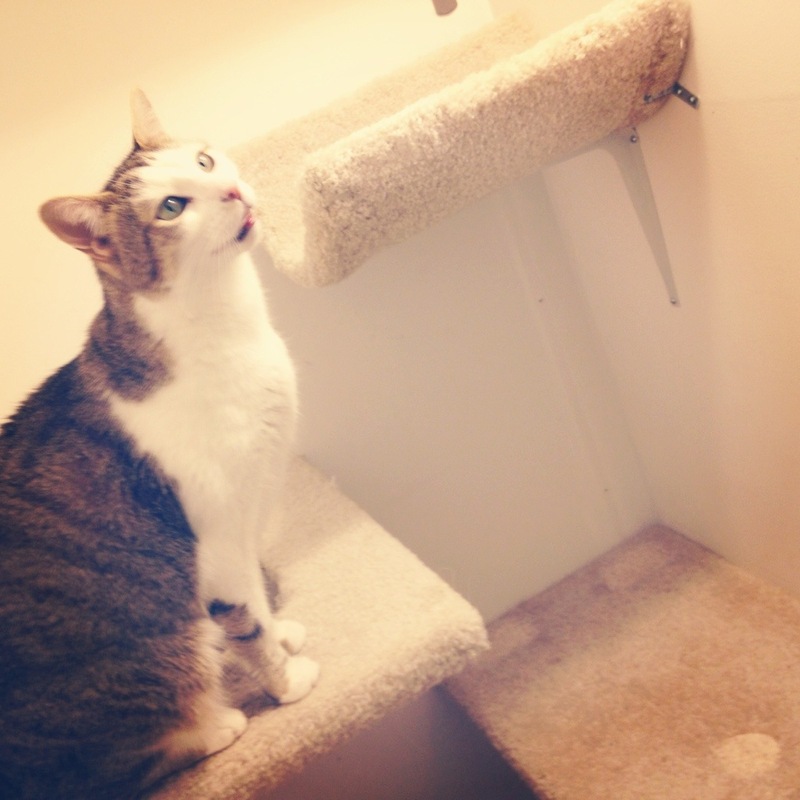 And just for good measure, here’s a before and after, complete with MS paint edited litter box. It was clean but I still felt like it would be better to cut it out for good measure. I’d say when all was said and done, this was definitely worth the <$100 we spent to make it happen. We’re getting ready to spend some quality time with family but I wanted to pop in quickly to say Happy Thanksgiving! I’ll have some fully fleshed out posts soon but in the meantime, here are a couple of sneak peeks of two projects I mentioned in the last post! Hope you all enjoy the holiday! Dropping in to give a little update on where we are and where we are going from here. The weather has been all over the place lately and we haven’t spent much time working outside. 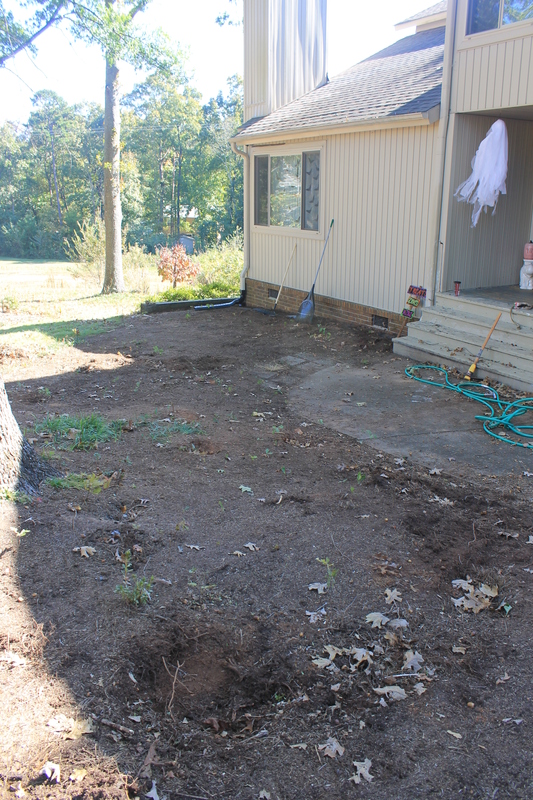 We got our grass seed down, and our new foundation plants in but that’s pretty much it. 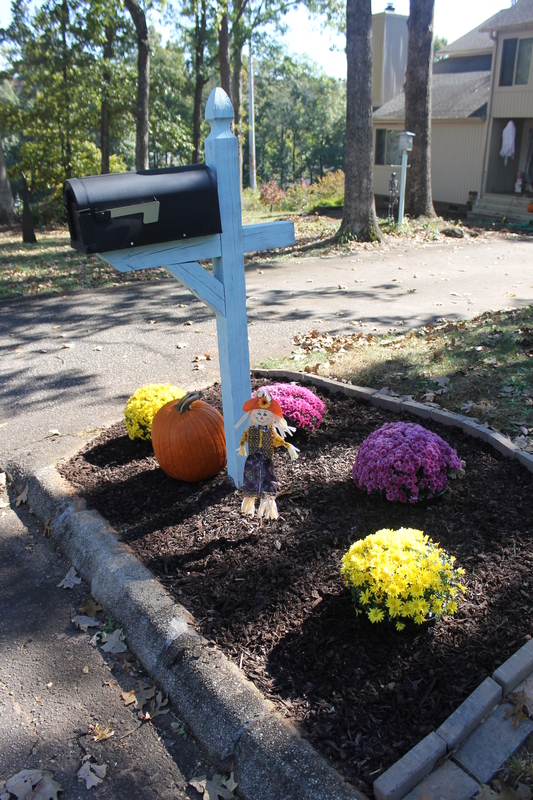 We’ve decided to hold off on a few things until the spring, namely installing edging and putting down our mulch beds. We did mulch around our new foundation plants, but we will be putting down more after we install the edging in the spring. We’ve also decided to hold off on refinishing the front porch. Turns out we have some rot we have to deal with and things need to be replaced so we felt like it makes the most sense to wait until the spring since we’re getting ready to dive into the holidays and we’ll be short on time, money, and patience. 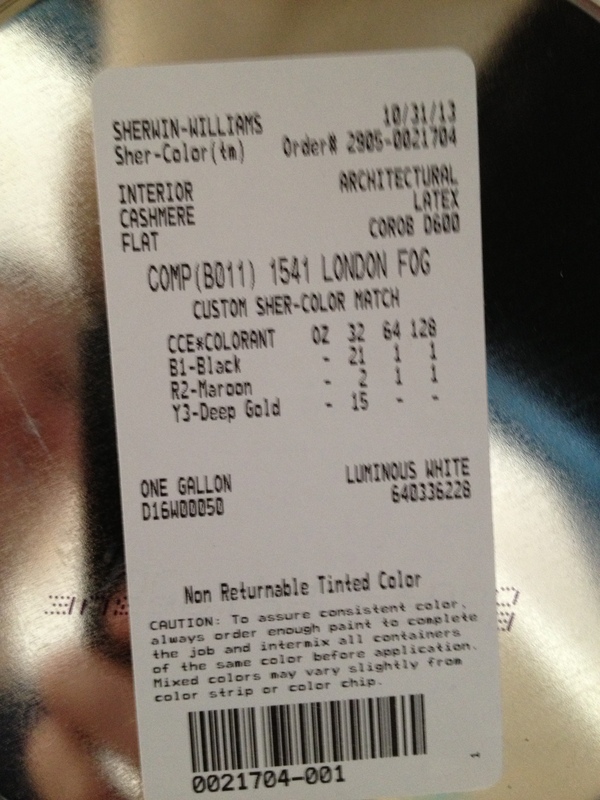 Yep, we’re finally going to start re-painting our grey-purple downstairs! We thought this would be a good winter project since we’ll be trapped inside anyway. The bad news? We discovered a while ago that the whole house (we think) was actually covered in wall paper which was painted over by the previous owners instead of removed. Some of it seems to be started to come off the walls so we decided to make things right which means removing all of the painted over wall paper. I can’t imagine this is going to be fun and I’m sure more than a few inappropriate words will be shouted. 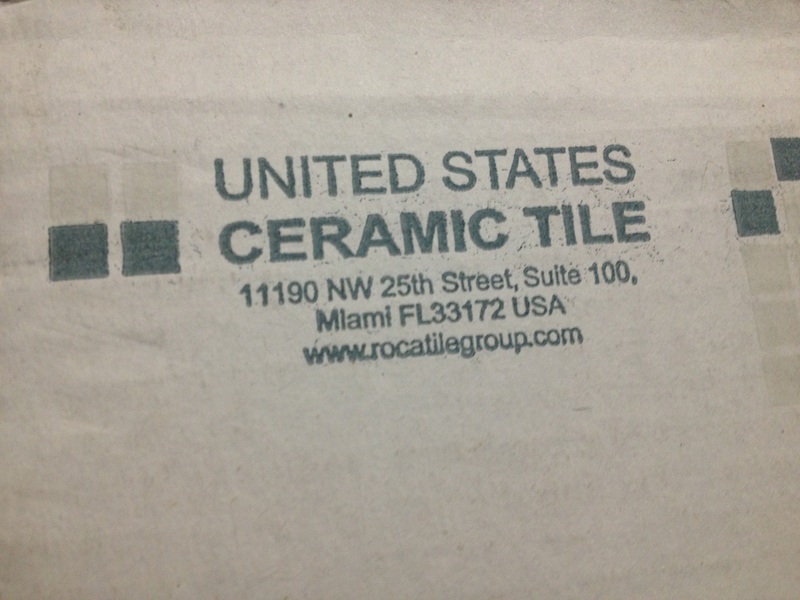 We picked up the tile to start our backsplash! We thought this would be another good winter project for us. I’m not giving away any details on this one. Just know, I am very excited. 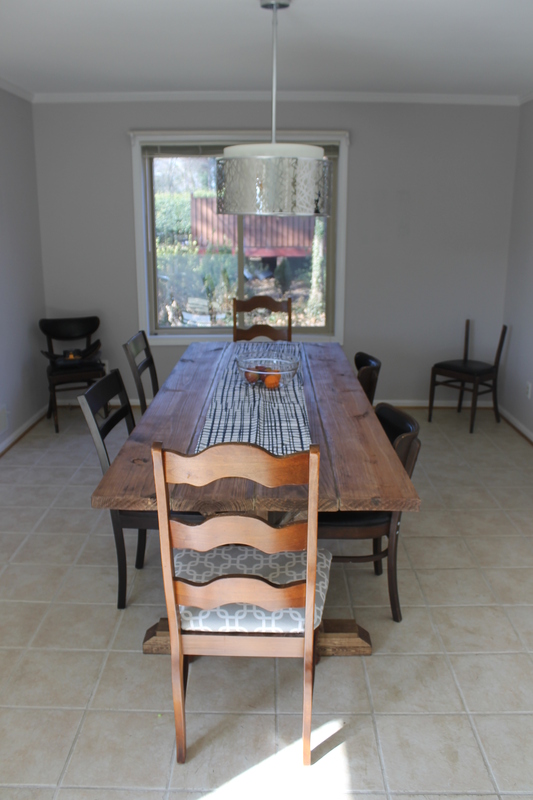 Several months ago, we purchased lumber to build a new dining room table. Our old one is pretty shot and I bought it from a fellow graduate at the end of senior year so it wasn’t really a quality piece (and I’m sure leaving it on our porch for several months in ridiculous monsoon conditions didn’t help…whoops!). Well, we finally started on it! 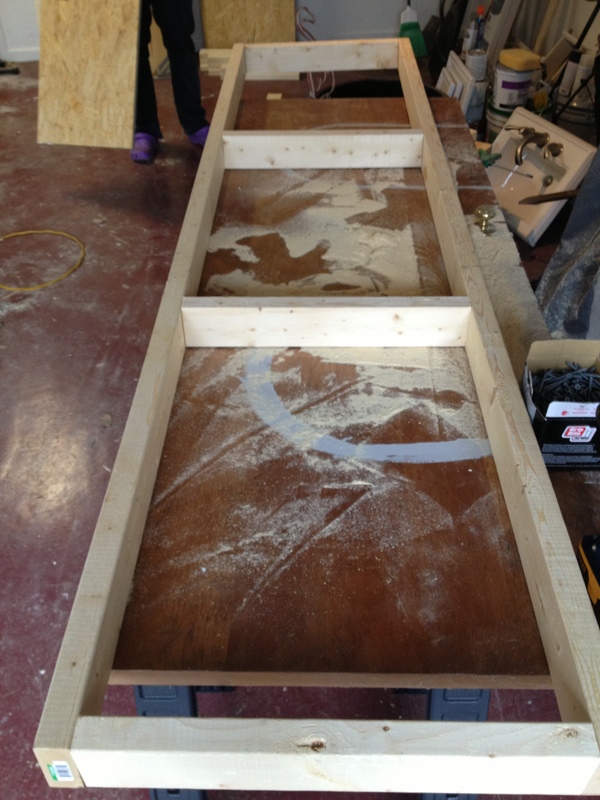 We’ve been working on the table top today and we still have a lot to do but so far we’re really happy with it. 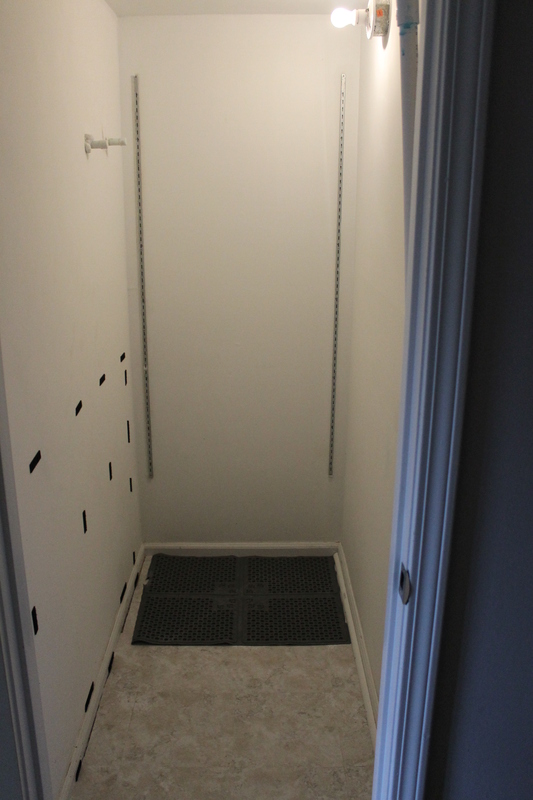 A closet for our cats. Currently in progress and 1000% more frustrating than I thought it would be – is anyone surprise? Not really? Yeah, that’s what I figured. 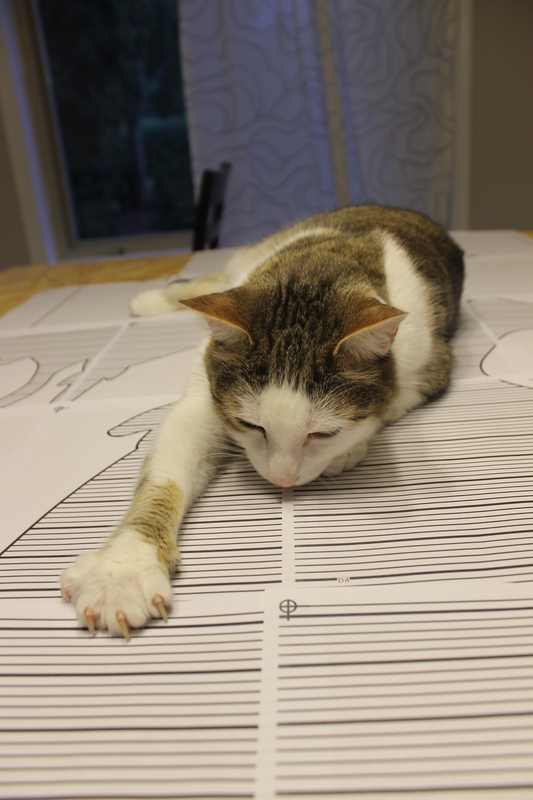 We’re in the middle of both the dining room table and the cat closet and hope to have them both finished in the next week and a half or so. We probably won’t work on much else until after Christmas but I do still plan on posting at least once a week. In fact, I have lots of kitchen things to discuss (whaaaaaat?!) and I plan on doing some more seasonal decorating right after Thanksgiving so I’ll be sure to share what’s going on there. Now that the temperatures are cooler and we don’t break into a sweat as soon as we walk out the front door, we decided to turn our attention to the front yard. We don’t have a huge lot, but at almost half an acre it’s still a big job so we’re just focusing on the front yard this year. Our biggest goal for this project is to try and get some grass to grow which according to the previous owners is an impossible task. I don’t like to be told I can’t make something happen so we’re going to throw down some grass seed anyway. Plus, I really, really, really hate pine straw. It’s everywhere and I hate it and I want it gone! 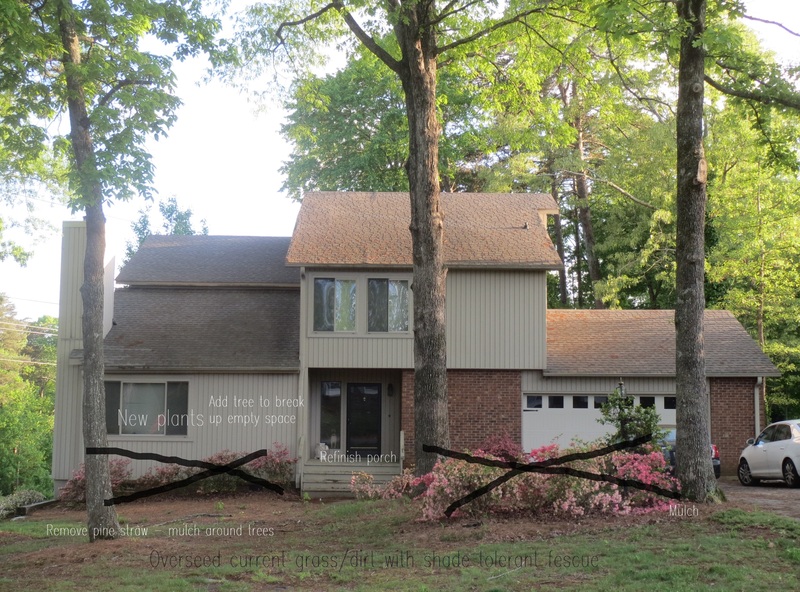 When we started, we were working with patches of grass, weeds, moss, dirt, a crap to of pine straw, and dead leaves; not to mention at least 15 overgrown, scraggly azalea bushes. Pretty. 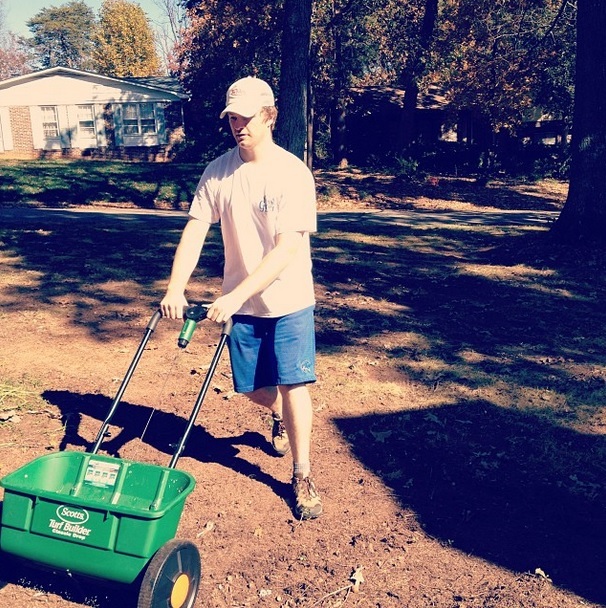 Last weekend, we managed to rake most of the pine straw and leaves out (which, by the way, was a huge pain and I let more than a few colorful words slip…loudly. Sorry neighbors, you may want to throw some earmuffs on your little ones when you see me don my floral gloves and grab the rake). It took hours of work both Saturday and Sunday and over this past weekend, we had even more leaves to rake up. We also spent hours digging holes for our new foundation plants. I told Kyle I refuse to plant anything new when we rip up the backyard because spending hours digging six holes is just not cool, man. We put in some Indian Hawthorns and a Knock Out Rose tree to help break up the big blank space to the right of the window (thanks to my awesome in-laws for that idea!). They all look a little weak right now but eventually, they’ll be big and beautiful and they won’t make Miss Barley sick like the azaleas did. This past weekend, we were able to get the grass seed on the ground, do a bit of grading, and mulch around the new plants. We still have to buy and lay down the pavers before we can finish mulching but I’m just thrilled to have the grass seed done. Now we just have to sit back and see if it takes! I’m in the process of giving the blog a little face lift so bear with me while I work through some of the changes. I’d love any feedback on any changes you notice. I’ll be back soon to fill you in on what we’ve been working on at the house, promise! You should know that I am a little bit obsessed with seasonal and holiday decor. 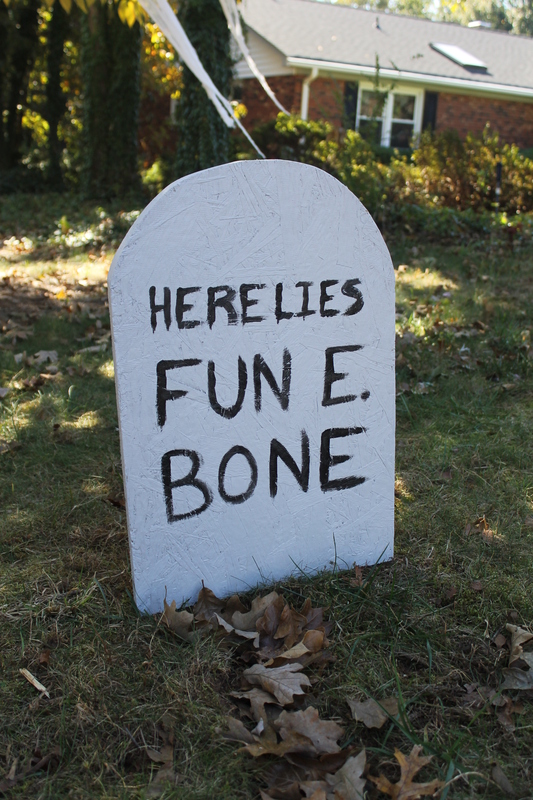 Like, if I had an unlimited budget we would have that 20ft inflatable grim reaper and the still large but not quite as massive skeleton playing an organ made of bones I saw at Lowe’s in our yard right this very second. Christmas would cause our electricity bill to go up by 300% and there would be a real life Easter bunny sitting in our yard come April. 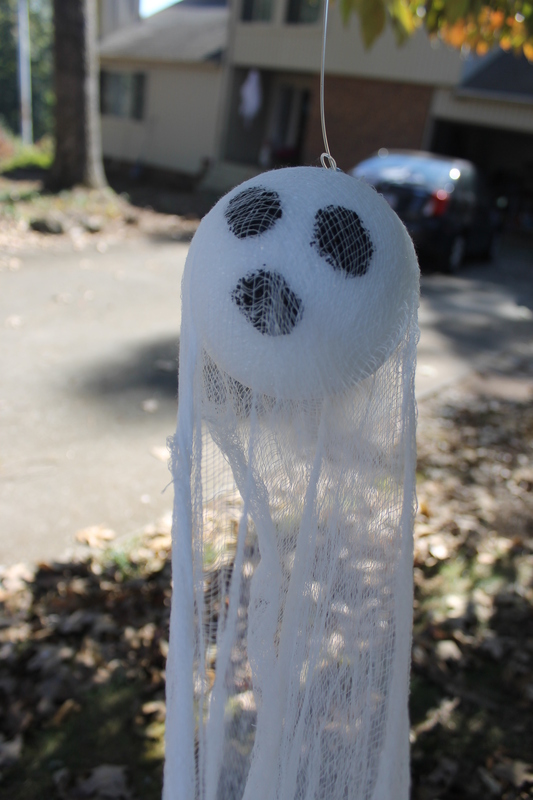 Sadly, we had a very limited, very real budget so we ended up hand crafting most of our decorations this year. I guess I could have just taped the roof repair bill we just got to the front of the house and that would have been scary enough….hm, maybe next time. 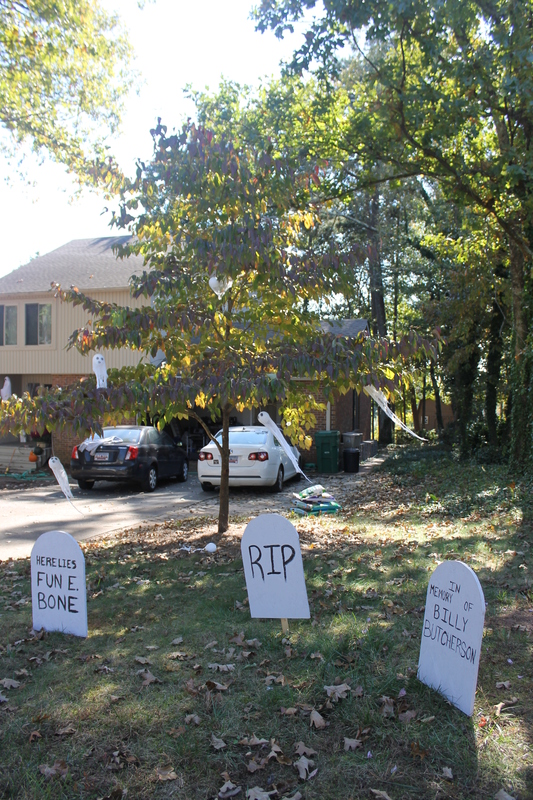 First up, we made a graveyard complete with ghost tree. Everything here was really simple. 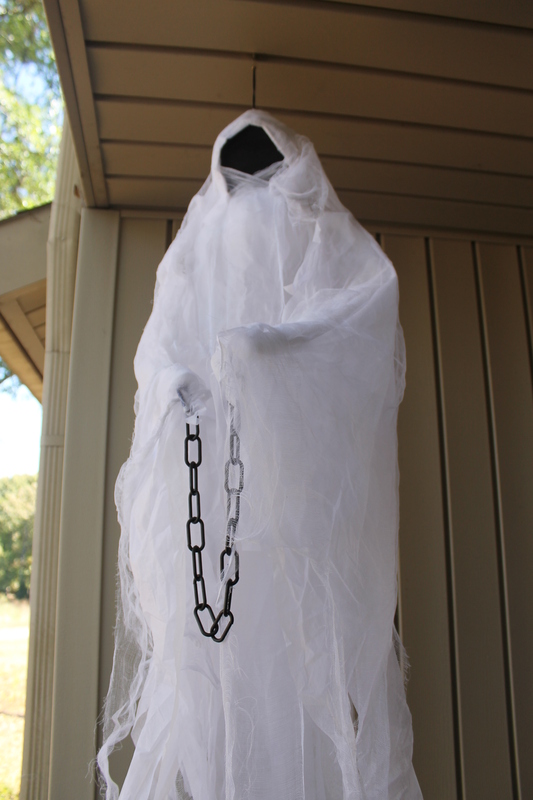 For the ghosts, I just grabbed some styrofoam balls and black craft paint from Hobby Lobby and picked up some cheesecloth from Home Depot. We thought we still had some cheesecloth buried in our garage but we couldn’t find it so I just picked up a new pack since it’s pretty cheap. 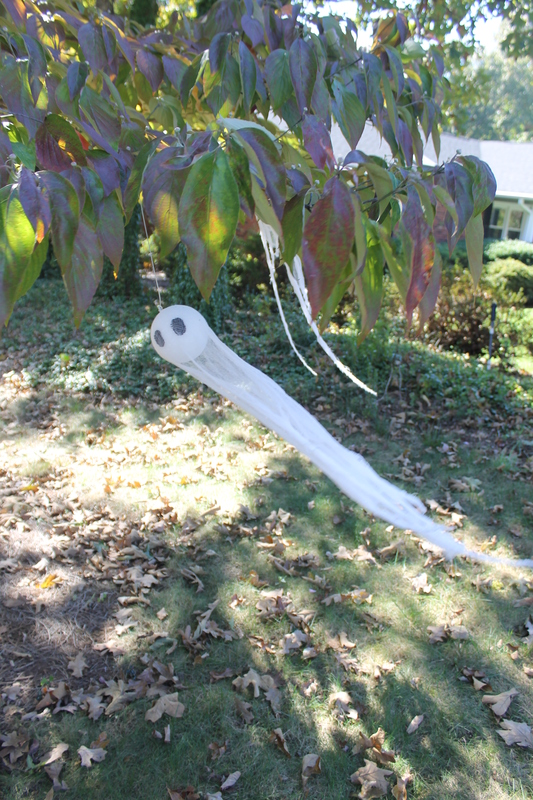 You just dab some black paint on the ghosts to make eyes/mouths and then cover them with some cut up cheesecloth. The most difficult part was probably hanging them. 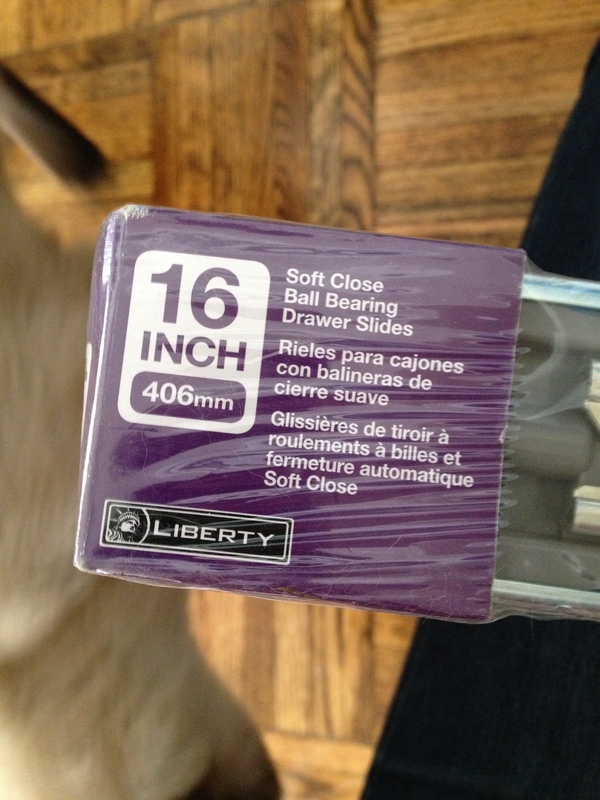 We picked up some eyelet hooks but the ones we grabbed were too small to work. Instead of heading back to Home Depot, we just used normal screws and tied some clear wire around them to hang on the branches. They’ve been pretty sturdy even with all of the wind we’ve had – we’ve only lost one so far. 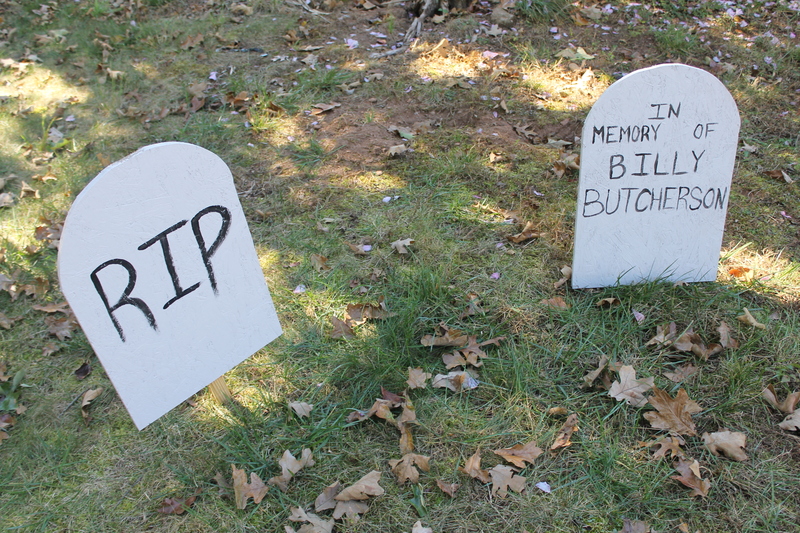 The tombstones are made out of scrap plywood. We just used some of the left over paint from when we painted the downstairs back in April and then painted the words with the same paint I used for the ghosts. Then we just slapped some garden stakes on the back and plopped those suckers in the ground with only medium difficulty. The middle tombstone went as far in the ground as we could get it and instead of moving it, we got lazy and left it as is. 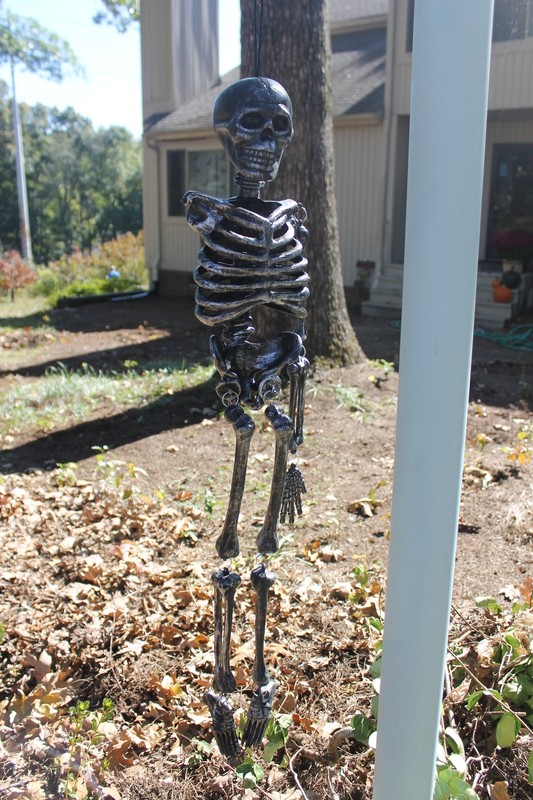 On the other side of the driveway, we hung a plastic skeleton on our lamp post. You may notice that there’s a lot less greenery around this than when we updated it a few months ago. More on that later this week. We probably wouldn’t have bought this guy, but the Halloween decor at Lowe’s was on sale and we got an extra 30% off because he was missing an arm. If anything, I think it just makes him creepier. 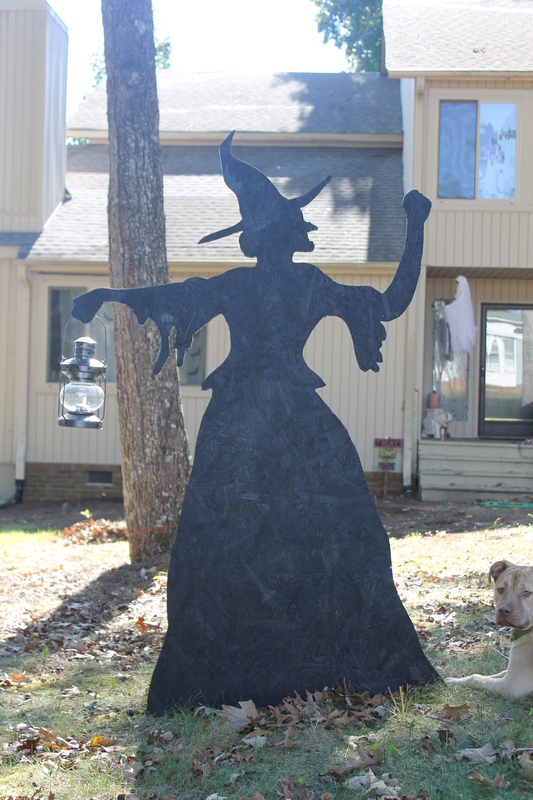 Moving across the yard, we come to the witch. 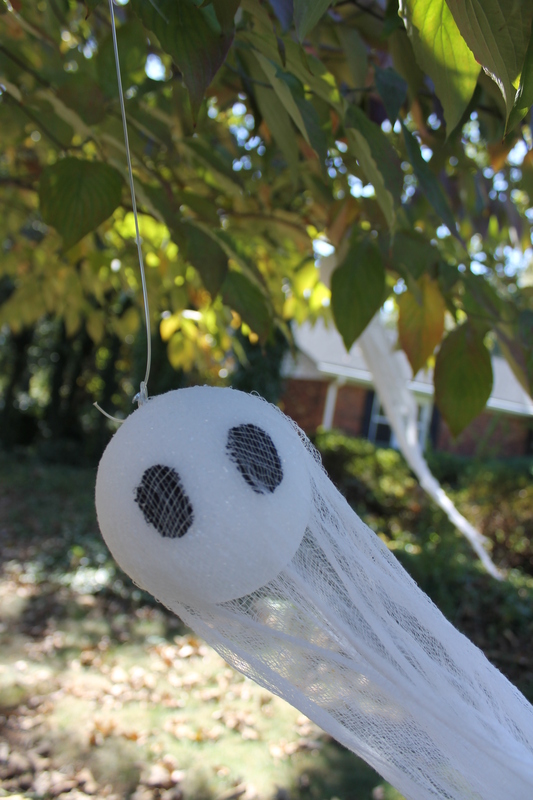 This is my favorite decoration, I think. 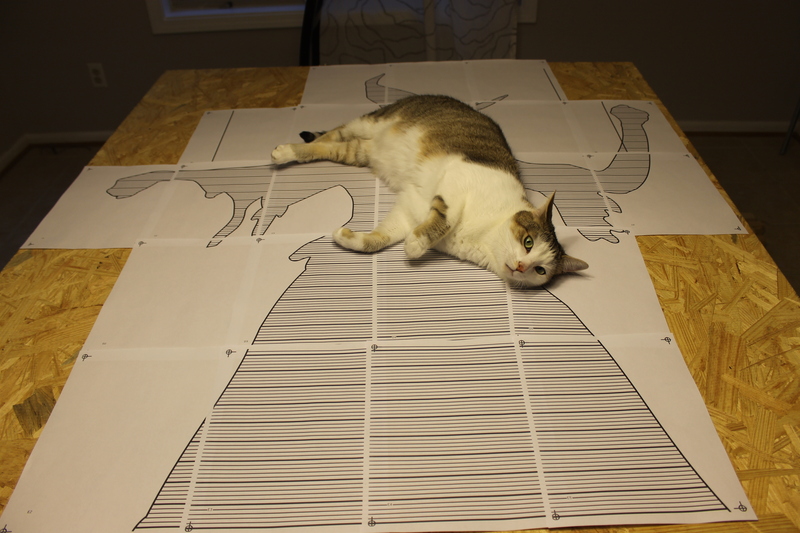 We just used a Martha Stewart template to trace out the witch on some plywood (with help from Gatsby, of course). 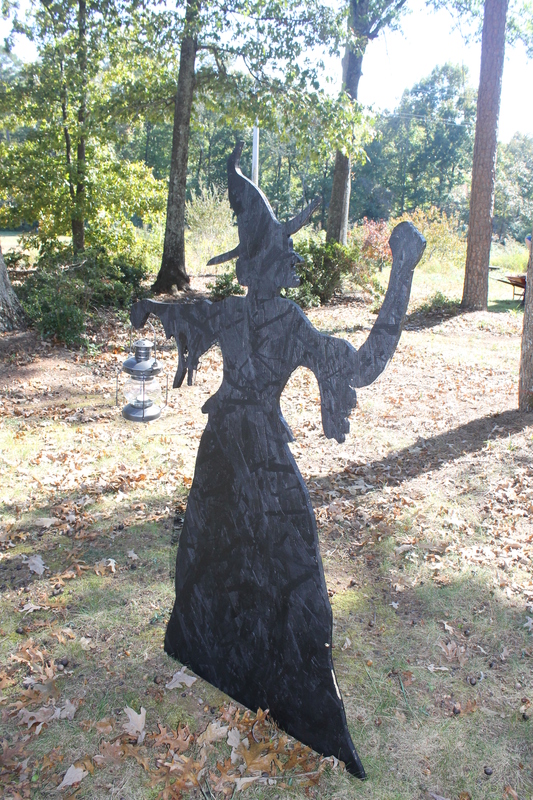 Kyle cut her out with the jigsaw and then I gave her a coat of black paint on each side. We sunk some conduit in the ground and strapped her to it. She’s supposed to have a broom in the other hand but true story: Barley ended up getting stuck, freaking out, and bending the conduit – sending the witch flying across the yard all before we could decide on what to use for a broom and get it secured. 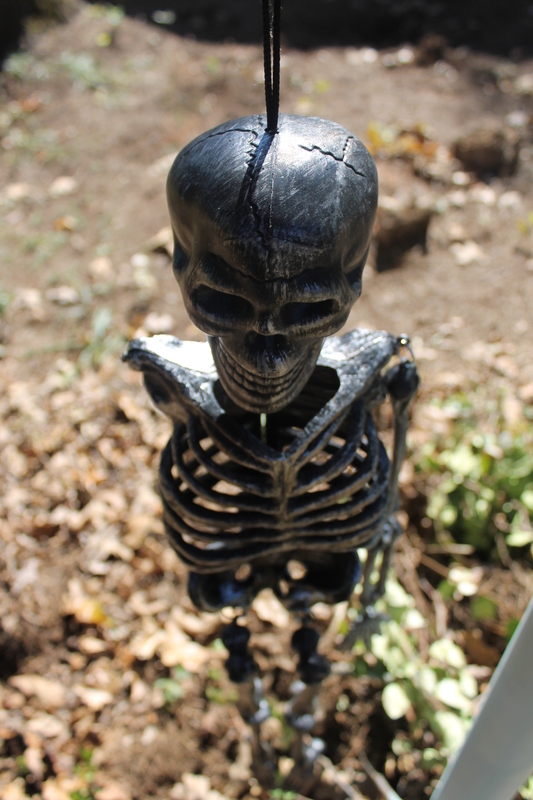 We have to put her back in the ground sometime this week before Halloween. We bought a bunch of those lanterns last year from Big Lots to use as centerpieces for our rehearsal dinner. I just grabbed one out of the garage and we secured it with one of the same brackets we used for the conduit. 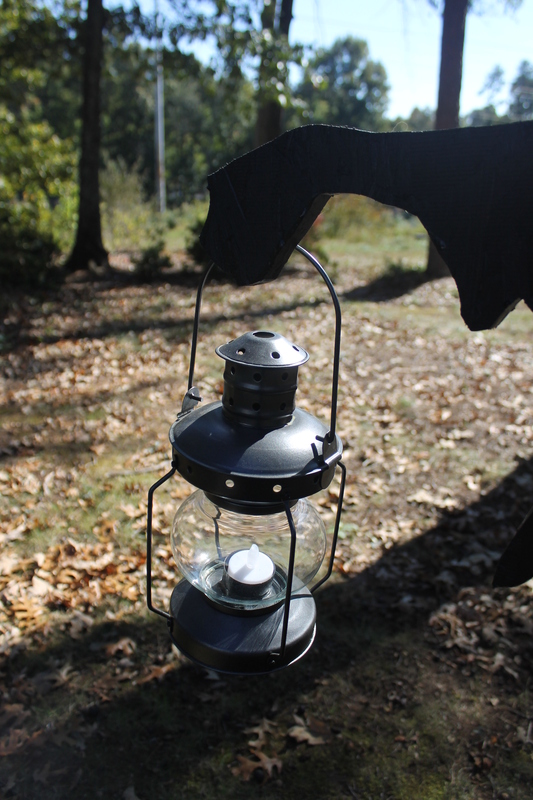 We added a color changing LED tea light to her lantern so at night it glows red, yellow, green, orange, and purple. 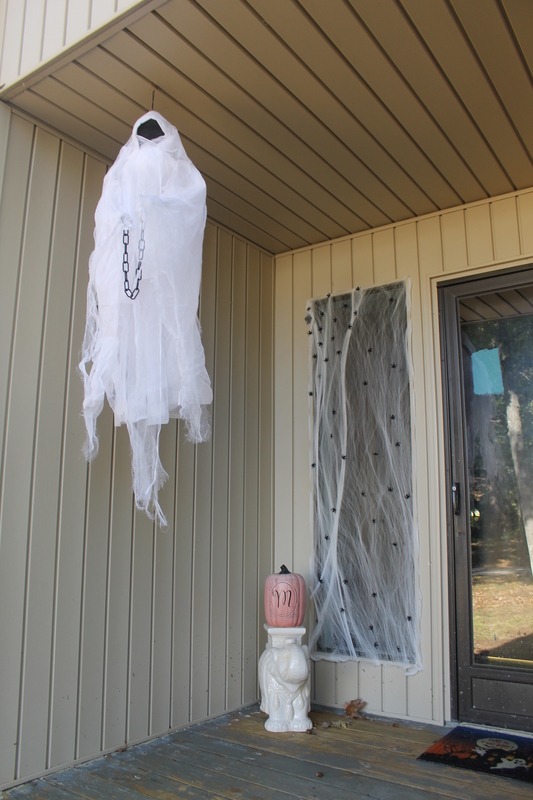 We bought everything that’s on the porch instead of going the DIY route- the hanging guy (whose eyes glow red), and the web/spiders on the window came from Target. 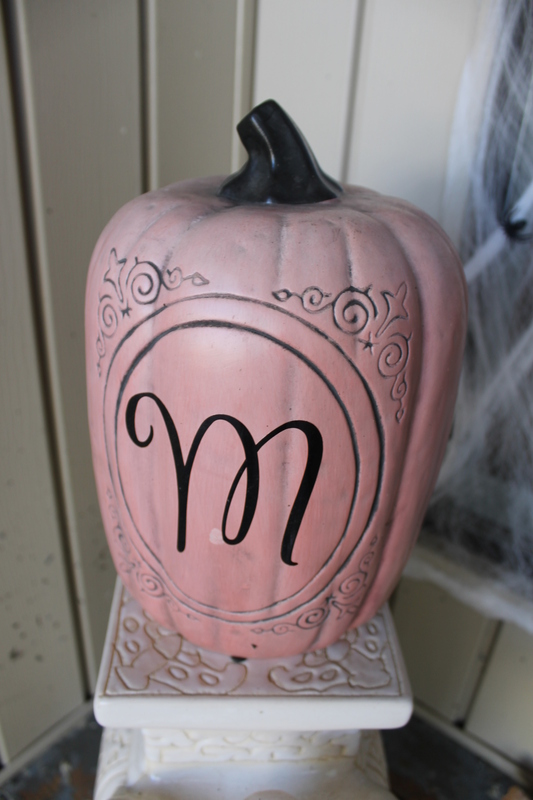 That faded pumpkin came from Hobby Lobby last year…it should probably be retired soon or at least cleaned up a bit. 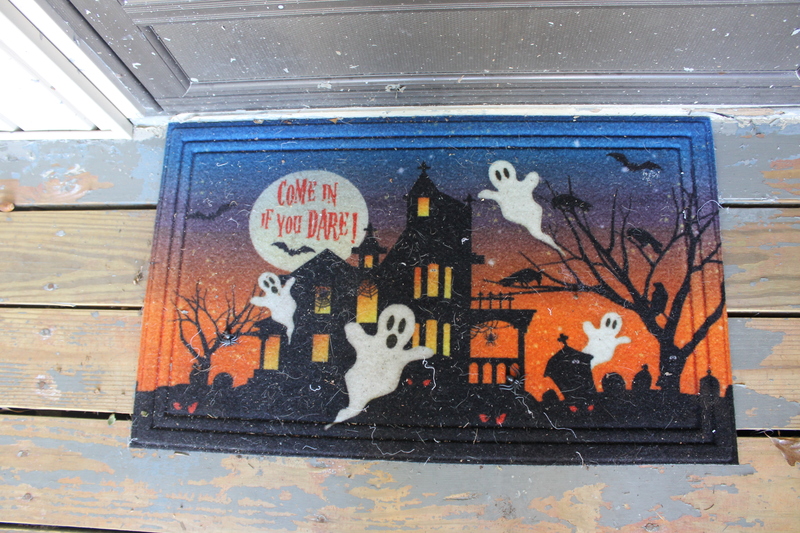 The welcome mat was on sale at either Lowe’s or Home Depot – can’t remember which (sorry!). 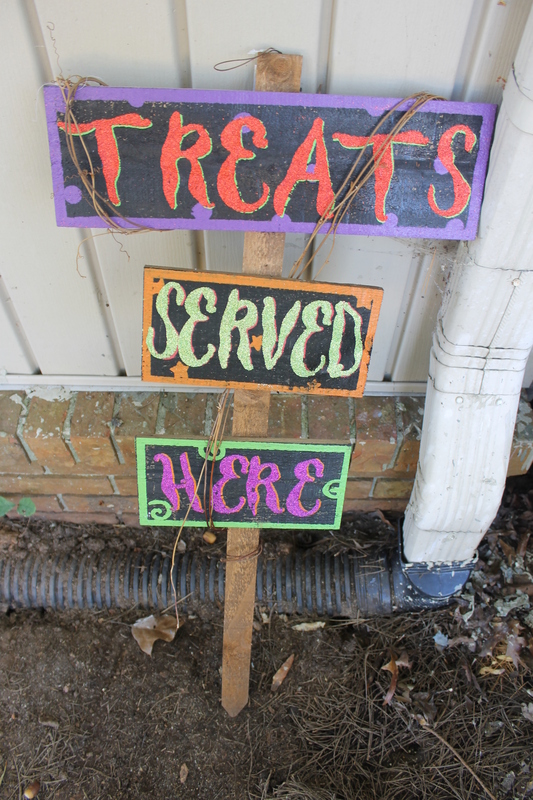 I also picked up this sign that currently lives next to the porch. I got it at Hobby Lobby for 40% off. 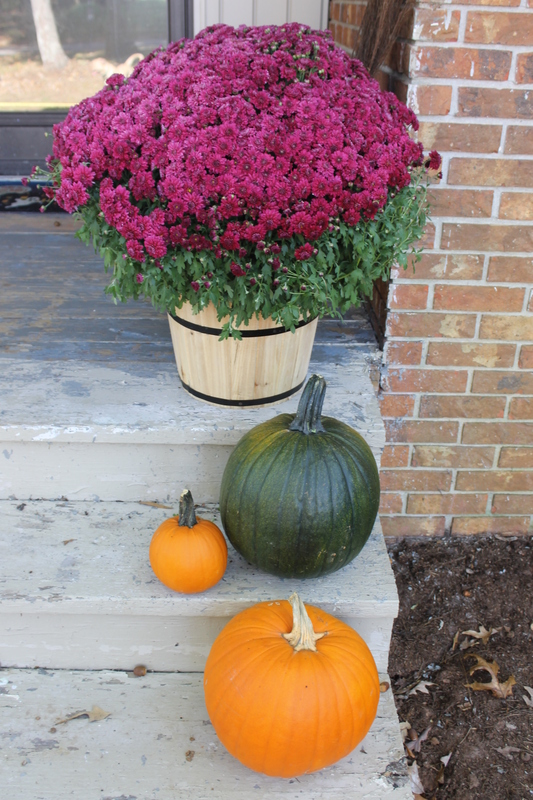 The pumpkins came from our pumpkin picking adventure a couple of weekends ago and the giant planter of mums was on clearance at Lowe’s (obviously, clearance is the secret word today). 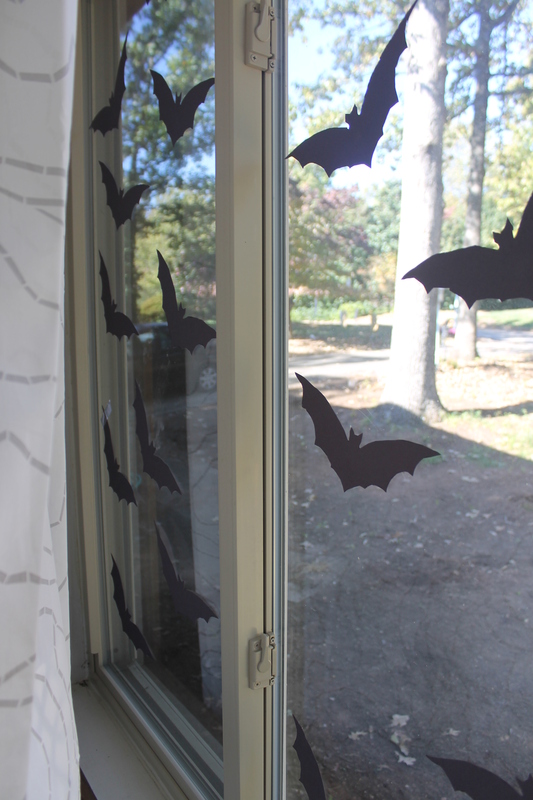 Last but not least, my construction paper bats. I found a template online because if I tried to draw these free handed they would probably look like butterfly-snowflake hybrids (artist, I am not). 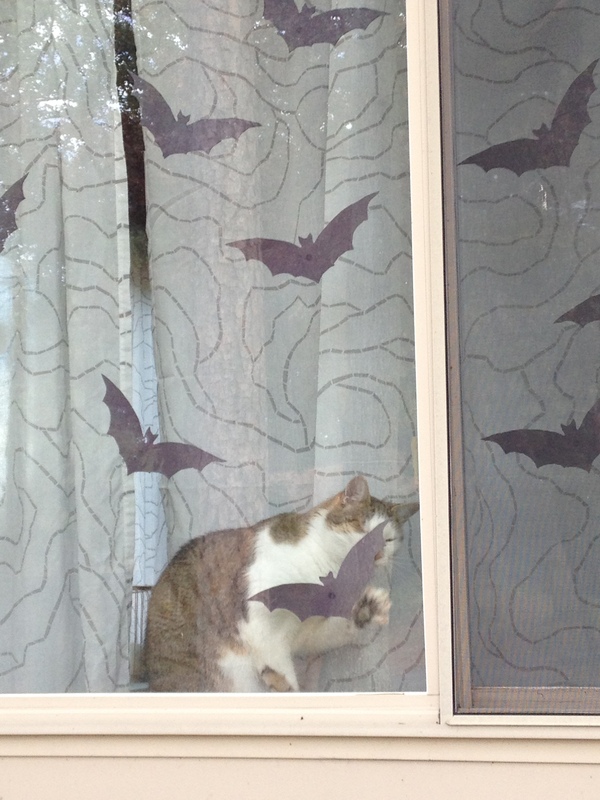 I just traced them out on construction paper, cut them out, and used glue dots to stick them on the windows in the living room. We already had the construction paper so I didn’t even have to pay anything. Bonus! My favorite view of these guys is at night. We bought an orange bulb to put in the lamp in our living room so at night there’s a nice orange glow behind the bats. Of course, the cats have been trying to rid the house of these beasts ever since the first one went up. 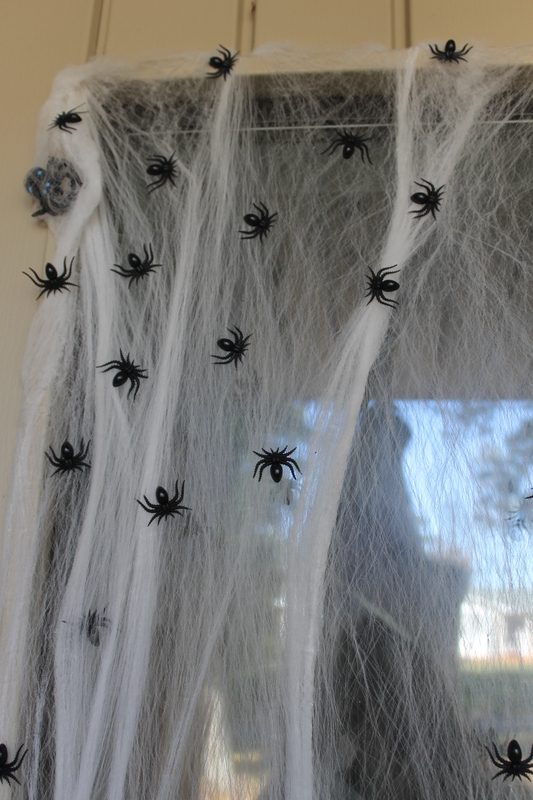 We didn’t do any decorating inside the house this year nor are we having the Halloween party we had wanted to but I promise we’ve been busy with other things that I’ll share soon!